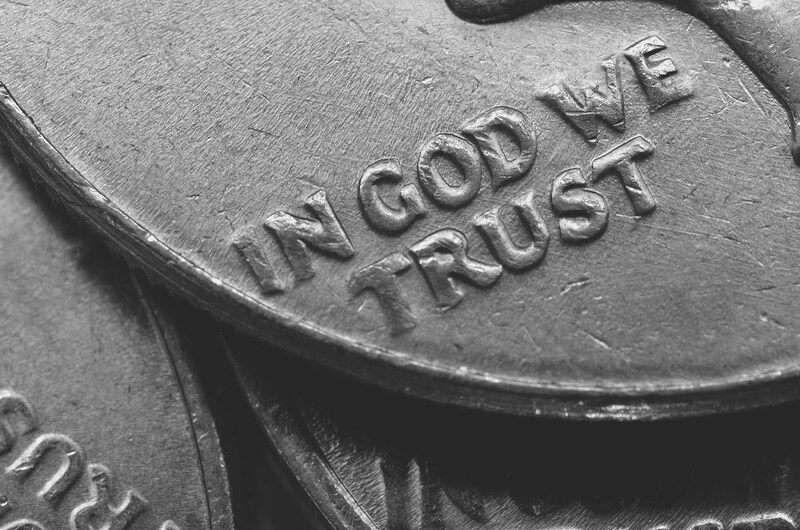 If you look at any coin or paper bill in America, you will see the words “In God We Trust” printed on its surface. The phrase found its way onto all U.S. currency in the thick of the Cold War (around the same time, and for the same reasons, that “under God” was added to the Pledge of Allegiance). As part of the cultural war on “godless” communism, a 1955 congressional vote elected to place the motto on all U.S. money. 1 The phrase makes a bold claim that America trusts in God, or a “god”, it does not specify which god. But does America really trust in the God of the Bible? Let’s take a look and see if the United States really puts their money where their mouth is. To gain some level of understanding of where America places its trust, we must look at something that provides some kind of metrics. Trust, by definition means, the “belief in the reliability, truth, ability, or strength of something.” So the question becomes, what does America believe most strongly in regarding it’s ability or strength? The claim is that America believes most strongly in God’s ability and strength, but how can we measure this to see if it is indeed true? One way we can measure this is to look at where the United States spends most of it’s resources. When we take a look at the Federal Discretionary Spending (the budget that things like energy, education, military, and government come out of), we see a very eye-opening picture. In 2015, the U.S. spent 54% of its discretionary budget on the military, more than any other category. Compare this to 6% spent on education.2 America’s military budget is larger than the next 8 countries combined.3 Maintaining the status of the world’s most powerful nation isn’t cheap. The United States boasts over 800 military bases around the world, the most advanced war technology, best trained soldiers, and the largest amount of bullets, bombs, guns, tanks, ships, and jets. The United States’ warfare spending is over one-third of the entire planet’s defense spending.4 When it comes to trust, military might is where America hedges most of its bets. If the United States really trusted in the God of the Bible, it wouldn’t have a military at all, that is, if the nation’s policies were modeled after the way of Christ. Jesus and the New Testament writers had a lot to say about violence and warfare, and none of it was in its favor.5 Scripture is quite emphatic that Christians should not participate in or support war (read more here). The teachings of Christ strike most of us as impractical, if not insane, unpatriotic, and even immoral when applied to worldly government. For those worried: Jesus didn’t come to change the way empires operate, rather, he came to set up his own nation with a new citizenship. For the sake of this article’s argument, let’s ignore the New Testament and take a look at the perimeters God laid out during a time period when He did seemingly allow for warfare. America has often been compared with Israel, a people establishing and maintaining a promised land. In the Old Testament, it is recorded that God had the people of Israel fight wars and claim land. Apparently, military action was justified and commanded. 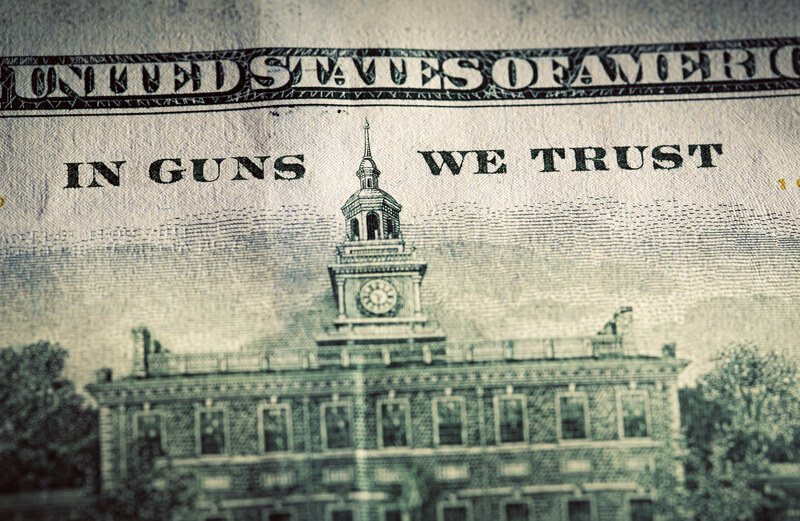 America with its motto printed on all its currency claims to trust in God. In the Old Testament we read about a God who desired for his people to trust in Him also. All the other nations surrounding Israel had a king or a pharaoh that commanded large armies to protect their people. Desiring for his people to trust in Him alone and not their own military might, God set up Israel differently. Not trusting that God can fight our battles for us, we spend trillions of dollars on our own military. Rather than trust in God to protect our nation, we have a military we trust in. Israel rebelled too, and they established a human army. God wanted excess money to be given to the poor, not to fund a military. God did not allow Israel to have the financial means to support an army. Having the most expensive military in the world, this is another way that America does not trust God. If anyone had recently built a house, planted a vineyard, betrothed a wife, or is simply “fearful and fainthearted,” he didn’t have to go to war. By having an untrained volunteer army of farmers, Israel would need to trust in God to win their battles for them. This is a clear example that the United States does not trust God. Horses and chariots were the ancient version of tanks. The army with the most of them was bound to win the war. God commanded Israel, after a battle, to destroy their enemy’s tanks so that Israel couldn’t use them in further battles. By stockpiling advanced weaponry, including thousands of nukes, America has proven that it does not trust God. God, in the Old Testament, never gave Israel a free pass to use their military any way they wanted. In 2 Chronicles 20, the Moabites and Ammonites invade Israel, so King Jehoshaphat leads out an Israelite force to meet them in battle. Instead of sharpening their swords and strapping on armor, the Israelites pray, fast, and sing a bunch of worship songs to prepare for battle. “You will not need to fight in this battle,” shouts the priest. “Stand firm, hold your position, and see the salvation of the LORD on your behalf” ( v17 ). When they go to fight, they find their enemies already defeated by God ( v22 ). God wanted Israel to trust Him. The way God helped Israel trust was to make the people reliant on Him. Israel wasn’t able to trust in their own strength to win battles or protect their land. God protected Israel and He often fought without any assistance ( Exodus 14-15 , Joshua 10 , 2 Chronicles 20, 32 ). Even when Israel did fight, they weren’t allowed to kill whomever they wanted or invade a country to dismantle an unjust government. Israel wasn’t permitted to preemptively strike another nation who were building chariots of mass destruction. Israel had to wait on God’s orders. Ancient Israel obviously didn’t always trust in God, but guidelines were laid out so that they could if they wanted to. God’s warfare policy was brilliant in the way it made the nation trust in Him. The Old Testament is often appealed to when Christians try to justify America’s military actions. So, even if Americans were to completely ignore New Testament teachings and live only by the Old Testament, this is what America’s policies should look like: enlistment would be by volunteer only (which it is currently), the military would not be funded by taxation. America would not stockpile superior weapons (no tanks, drones, F-22s, and of course no nuclear weapons). America would make sure its victories were determined by God’s miraculous intervention, not by military might. Rather than outnumbering the enemy, America would deliberately fight out-manned and under-gunned. There would be no training, no boot camp, no preparation other than fasting, praying, and singing worship songs. So, does it look like America trusts in God according to the Old Testament? This refers not just to wealth, but to economic power that would be used, at least in part, to build and sustain a powerful military (see Millard Lind, Yahweh Is a Warrior [Scottdale, PA: Herald Press, 1980], 151). This becomes most clear in verse 9, where the military captains are appointed at the time of war.